I started backpacking while working for the National Park Service ten years ago. I have been a backcountry ranger/law enforcement ranger and served on search and rescue crews. I typically take two or more camping trips a month, year round. I appreciate light weight, but am not obsessed by it. I often carry a 30 lb (14 kg) pack and stay out from three to nine days at a time. I also enjoy day trips with only water on my back. I take trips to Colorado and Montana in the summertime and enjoy the outdoors there as well. The Mountainsmith Carbonlite Pro Trekking Poles are the top of the line of trekking poles from Mountainsmith. The aluminum poles open in three telescoping sections locking and unlocking with a Quick-twist locking mechanism. The bottom section has only one measurement marking that says STOP. The middle section has measurement markings from 47 in to 57 in (119 cm to 145 cm). I did not find information on the website, or in the literature accompanying the poles, that told me if the lower section is supposed to be extended all the way to the word STOP or not, so I just went ahead and set the section a little below the indicator. I set the middle section at about 50 in (127 cm) and leaned on one pole. I noticed the springy feeling of the Anti-Shock absorption system right away. I bounced a little on the pole with two hands to see how much give there was. The pole moved up and down a lot more than I expected and felt like it could really take the brunt of my weight. I loosened the adjustable wrist strap and slid my hand in. The strap adjusts to a larger loop by simply pulling my hand away from the pole while in the strap. Tightening the strap is also easy, I just pull on the plastic tab with my opposite hand. The strap has a thick section that sits on the back of my hand comfortably holding it in place. The poles feature a molded cork handle that feels firm to the touch. The molding separates my index and middle fingers and arches nicely into the palm of my hand. The cork doesn't feel as grippy as rubber which makes me wonder how well I will be holding on in the rain. I'm hoping that the design of the molding, along with the support of the wrist strap can work to keep my hand well connected. The poles are constructed of a carbon-wrapped 7075 aluminum. The Mountainsmith logo, as well as the words Carbonlite Pro, are printed on the upper section of the poles in the middle of the grey and white decals. The rest of the aluminum is painted black with the exception of the markings on the middle section and the word STOP on the lower section which are both in a silver color. There are rubber boot tips at the bottom of the poles that seem to supply a lot of grip to the ground. They are connected to the poles by a hard plastic piece that connects to the aluminum. 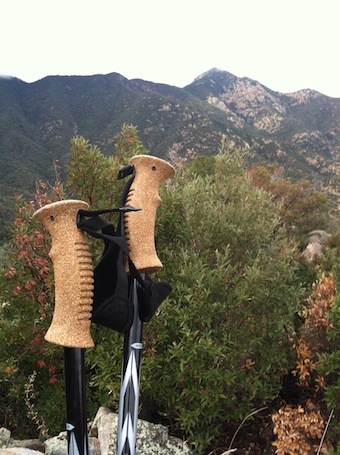 The poles come with narrow profile baskets that Mountainsmith says are easily removable. It took me a little bit, but I finally realized that with a slight twist and a little pull I could take off the boot tips and slide on the profile baskets with ease. There are two little plastic teeth that fit into the corresponding spot in the middle of the profile baskets. It wasn't until I looked at a video on the Mountainsmith website that I learned I could take the top section of the poles apart and adjust the spring of the Anti-shock system. A small nut can be tightened, which pushes down the spring and changes how much weight the poles will absorb. The middle and bottom section can also be completely separated by disconnecting the joint between them. The bottom section does not seem to have a spring, but there is still a nut that can be adjusted. The video also tells me that I should set the lower part of the poles right at the STOP marking. It also mentions that to measure the proper height of the poles, my elbows should be positioned at a 90 degree angle. I am excited to get these poles out on the trail! 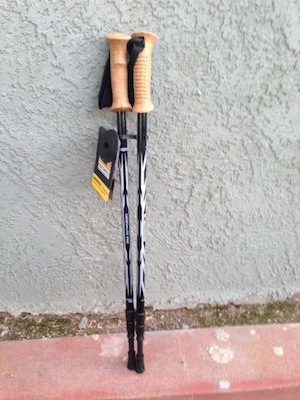 This is the first pair of trekking poles I have ever used even though I have been interested in them for years. The poles feel sturdy and strong and I hope they help ease the load on my back and knees when I am backpacking. 2. Shock absorption feels like it may be great! 1. None at this time! I used the trekking poles on multiple trips over this testing period. I took them on a couple overnight trips and a lot of day hikes. I used them on one overnight trip to the Rincon Mountains East of Tucson, Arizona where I hiked over 12 mi (19 km). The temperature ranged from 65 F to 90 F (18 C to 32 C) and the elevation ranged from 6,000 ft to 7,700 ft (1,829 m to 2,134 m). 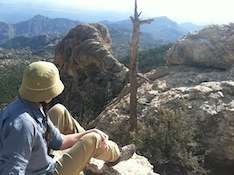 I also used them on an overnight trip to the Catalina Mountains North of Tucson, Arizona. I hiked from over 9,000 ft (2,743 m) down to 6,500 ft (1,981 m) and then back up to camp. The temperature was a cool 58 F (14 C) at the top and a warmer 85 F (29 C) at the lower elevation. I have taken the poles on countless day hikes into the Tucson Mountains West of Tucson, Arizona as well as the two previously mentioned mountain ranges. Elevation has ranged from 2,700 ft (823 m) up to more than 9,000 ft (2,743 m) and temperatures from 60 F to 95 F (16 C to 35 C). The poles have worked great for me as of this point. They have taken some stress off of my weak knees as I hiked downhill and that has been a great relief. They feel sturdy and only slightly bend when I put most of my body weight on them. I can't say they have been quite as comfortable on the uphills. In fact, they have become kind of a burden going up steep inclines. I feel like I need to shorten the length of the poles in order to accommodate the intense grade in the trail. I have resorted to simply carrying them while going uphill. I have also noticed that in the heat of Arizona, my hands sweat and slip off the grips. This caught me off guard once on Wasson Peak in the Tucson Mountains and I almost tumbled off the edge of a switchback. I became so worried about it happening again that I stopped using the poles all together resulting in the serious knee pain that evening. I suppose I could remedy this problem by wearing some gloves for grip, but again the Arizona heat wouldn't make this into a comfortable situation for me. I have never had any issues with this slipping unless my hands were sweating severely. For the most part the grip worked great and I had no troubles. Overall, I like the poles quite a lot. The help that they give my knees coming down the steep trails makes it more than worth it to carry them on the way up. 1. Great help for my aching knees while going down. 1. My hands can slip off the handle when extra sweaty. Thank you to Mountainsmith and BackpackGearTest.org for letting me test these poles!